Here in So Cal the weather has been more then inviting the past few days. Gorgeous clear skies, beautiful mid 70's and a gentle breeze to help cool you off. After the gloomy rainy days we've been having this is the type of weather to help ring in the soon-to-be summer days! A wonderful citrusy sangria in hand doesn't hurt to help cool you down. This past weekend my girls helped me find the most perfect blood oranges at the Farmers' Market. They were juicy, red stained and so sweet! I just love to break open a ripe blood orange to see the vibrant crimson color inside, don't you?? All my sangria recipes differ with optional fruits, bubbly and alcohol substitutes. Since I'm not a huge brandy fan, I opted out of using it in this recipe and subbed it for triple sec. Lime and blood orange compliment each other beautifully, so it was only natural to add the two together, right?! Right! Memo: Enjoy this citrus wine on a beautiful sunny day, full of bbq'ing fun! Most importantly, do not forget to invite yours truly! Combine all the ingredients (except for the garnish and the sparkling juice) together in a large jug. Stir well and place in the fridge overnight. When ready to serve pour the sparkling juice in the jug and pour into individual cups. Garnish with mint and blackberries. This looks amazing and great pictures too. You must live somewhere warm--jealous! Ohhhh, perfect with fish tacos!! These look so beautiful and tempting, Katie! What a fabulous and refreshing springtime treat. You've got to love those natural crimson hues that blood oranges open up to reveal! Thanks Georgia! I just love the color!! Oddly, Ky (5) won't touch them. She loves oranges but blood orange, no way! Gorgeous photos, Katie! I love sangria, especially this time of year! Thanks Sara! Yes, this will grace our brunch table once baby "Katie" is born! Would love to sit out on the porch and drink one of these today! Gorgeous!! Gorgeous, gorgeous, gorgeous! 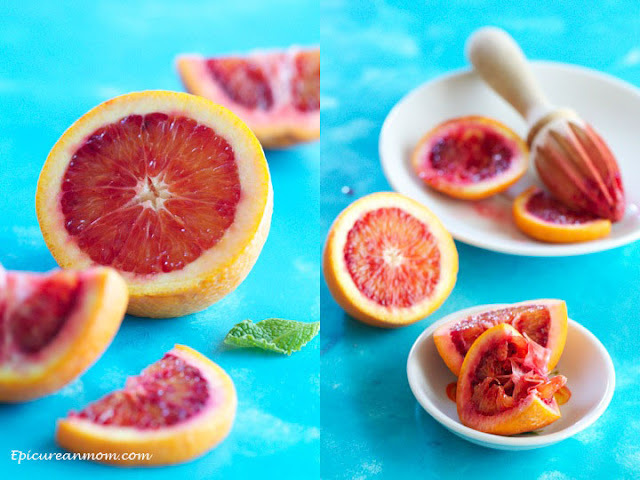 Love the vivid hue that blood oranges lend. Blood orange sangria is my type of drink! Beautiful photos too! Mmmm Katie your sangria looks soooo good! Perfect for sipping on those hot summer days. While it's no longer summer here, our weather is quite similar to So Cal and we are relatively warm all year round. I didn't know about blood oranges until a few years ago. The color is so amazing, really makes our drink special. I agree! Every time I cut into one, the color never ceases to amaze me! 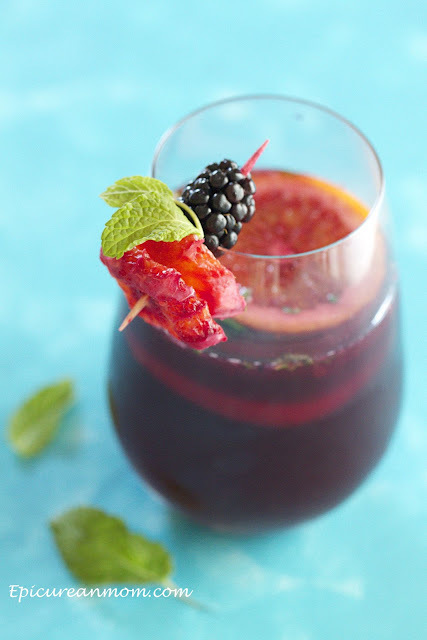 I love sangrias and I love how you incorporated blood oranges into them; fabulous idea! This looks so refreshing. 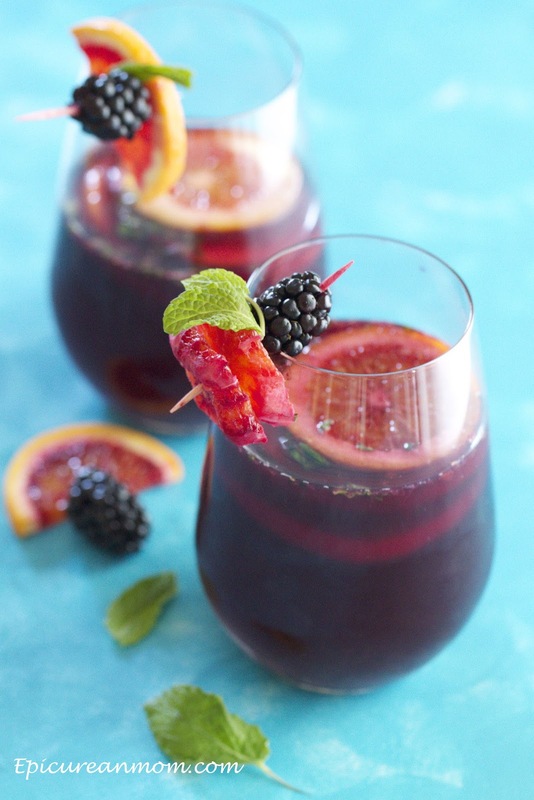 Sangria is one of my favorite go-to brunch drink!! Mmmmmm!! I love blood orange margs!! What a nice combination! I don't think I've had blood oranges in sangria before but it makes for a beautiful drink. I definitely agree! Definitely beautiful and oh so yummy!! Gorgeous! I want a whole pitcher of this to myself! Great pictures. Where do you find sparkling blood orange juice? What brand. I power washed my deck so I need to make some to celebrate a job well done! YUM! I could drink a glass of this right, about.... NOW! I made some Mango Sangria last Friday night, might have to give your recipe a go tonight. Thank you for sharing!